Beowulf ni tendi mashuhuri ya fasihi ya Kiingereza cha Kale. Kitabu kilichopo hadi sasa kiliandikwa mnamo 975-1025 BK, lakini inawezekana tendi ilitungwa mapema zaidi. Hilo shairi refu la aya 3182 linasimulia habari za kijana Beowulf anayetokea Uswidi pamoja na marafiki 14 kwa kusudi la kumsaidia mfalme wa Denmark Hrodgar. Hrodgar anateswa na Grendel ambaye ni zimwi mbaya anayemeza watu. Beowulf anamshinda Grendel na mama yake na kupokea zawadi nyingi kutoka Hrodgar. Kuna sehemu ya pili ya shairi ambamo Beowulf mzee ni mfalme mwenyewe. Anapaswa kushindana na joka anayeharibu nchi. Safari hii Beowulf anauawa akitetea nchi yake kwa sababu kati ya wafuasi wake ni mmoja tu anayemsaidia. gomban gyldan. Þæt wæs god cyning! and yield to him. He was a good king! Anderson, Sarah, ed. (2004), Introduction and historical/cultural contexts, Longman Cultural, ISBN 0-321-10720-9 . Chance, Jane (1990), "The Structural Unity of Beowulf: The Problem of Grendel's Mother", in Damico, Helen; Olsen, Alexandra Hennessey, New Readings on Women in Old English Literature, Bloomington, IN: Indiana University Press, pp. 248–61 . Chickering, Howell D. (2002), "Beowulf and 'Heaneywulf': review", The Kenyon Review, new 24 (1): 160–78 . Creed, Robert P (1990), Reconstructing the Rhythm of Beowulf, University of Missouri, ISBN 9780826207227 . Damico, Helen (1984), Beowulf's Wealhtheow and the Valkyrie Tradition, Madison: University of Wisconsin Press, ISBN 9780299095000 . "Anthropological and Cultural Approaches to Beowulf", The Heroic Age (5), Summer–Autumn 2001 . 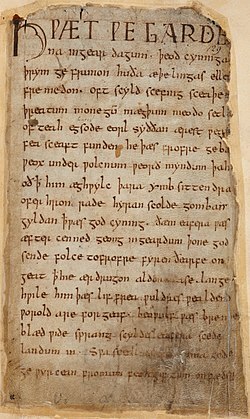 Lerer, Seth (Jan 2012), "Dragging the Monster from the Closet: Beowulf and the English Literary Tradition", Ragazine . Mitchell, Bruce; Robinson, Fred C (1998), Beowulf: an edition with relevant shorter texts, Oxford, UK; Malden, MA: Blackwell . Neidorf, Leonard, ed. (2014), The Dating of Beowulf: A Reassessment, Cambridge: DS Brewer, ISBN 978-1-84384-387-0 . Nicholson, Lewis E, ed. (1963), An Anthology of Beowulf Criticism, Notre Dame: University of Notre Dame Press, ISBN 0-268-00006-9 . North, Richard (2006), "The King's Soul: Danish Mythology in Beowulf", Origins of Beowulf: From Vergil to Wiglaf, Oxford: Oxford University Press . Schulman, Jana K; Szarmach, Paul E (2012), "Introduction", in Schulman, Jana K; Szarmach, Paul E, Beowulf and Kalamazoo, Kalamazoo: Medieval Institute, pp. 1–11, ISBN 978-1-58044-152-0 . Tolkien, John Ronald Reuel  (1997). Beowulf: The Monsters and the Critics and other essays. London: Harper Collins. Trask, Richard M (1998), "Preface to the Poems: Beowulf and Judith: Epic Companions", Beowulf and Judith: Two Heroes, Lanham, MD: University Press of America, pp. 11–14 . Zumthor, Paul (1984), Englehardt, Marilyn C transl, "The Text and the Voice", New Literary History 16 . Ukurasa huu umebadilishwa kwa mara ya mwisho tarehe 26 Februari 2019, saa 13:47.